Whew, here we are at the last day of the 2018 Blogging from A to Z Challenge. Kudos to everyone who hung in there and made it through all 26 posts! Today, I bring you Angels whose names begin with Z, because a) there are a surprising (to me) number of them, and b) it seems a perfect fit for A to Z.
Za'afiel: controls hurricanes and storms. Sometimes he is good, sometimes evil; accounts differ. 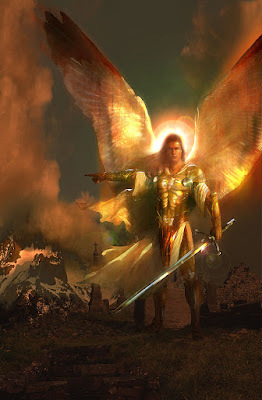 Artistic depictions of angels vary widely--male or female, winged or wingless, from flowing robes to military tunics and breastplates to the fiery wheels/spheres of the Ophanim mentioned in the Dead Sea Scrolls. Sometimes angels are gentle, kind, and helpful, sometimes they are pretty badass like our friend with the sword pictured above. Perhaps you are one of the many thousands of angel devotees who look toward the divine messengers for daily inspiration and guidance. Or perhaps you, like me, are fascinated by the concept of these supernatural beings that continue appear in religion, mythology, art, music, and literature from all over the world. Maybe you're simply a fan of the Los Angeles Angels baseball team. Regardless, if there are such things as guardian angels, I hope yours watches out for you today and always. Thank you for sticking with me for the A to Z challenge! Hope to see you again very soon. It's another world tree for today! Yggdrasill, the great cosmic ash tree, may be more familiar than yesterday's, as it comes from Norse mythology. 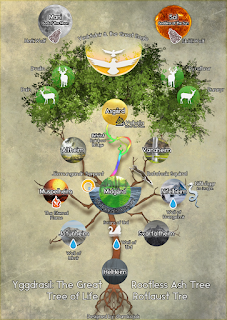 It grows out of the Well of Urd, and its branches spread wide to cover the whole world and span the heavens. Of the three wide roots, one extends to the Aesir (the gods), another to the land of the Frost Giants, and the last into the cold, misty land of Nifelheim. That third root is constantly gnawed on by Nidhogg, the dragon. An eagle perches at the top of the tree, with a hawk sitting between its eyes. Ratatosk the squirrel runs up and down the trunk, carrying messages between the eagle and the dragon, and stirring up trouble. Because, squirrels. Four stags wander among the branches, nibbling at the new growth. Three women known as the Norns (the fates) live near a fountain of holy water (the Urdar-fount) under the third root. (In German folklore, the Norns appear as fairy godmothers or spinners.) The gods hang around down there, too. Every day, the Norns draw water and sprinkle the branches to keep Yggdrasill healthy. Two swans drink from the Urdar-fount, and from them all other swans are descended. I just love the imagery: gods and fates and other assorted characters living together--sometimes peacefully, sometimes not--on and around a tree that brings balance to the nine realms of the Norse universe. The woodpecker is a familiar sight and sound in many places around the world, with the exception of Australia, New Zealand, New Guinea, Madagascar, and the poles. It has a strong, straight beak and a sticky tongue for finding and extracting insects from tree trunks and branches. Interestingly, the pecking causes the bird's skull to heat up, which is why they do it in bursts with cool-down breaks in between. They can be noisy little buggers, especially if they decide to start drumming on your chimney or rainspouts. The birds also figure prominently in religion and mythology. They are considered lucky by many western Native Americans, and bring happiness and friendship. Europeans thought the birds were harbingers of changes in the weather. The Babylonians associated them with fertility. In Greek mythology, the woodpecker was a bird of prophecy and magical powers and was sacred to Zeus and Ares. In Roman mythology, it was named Picus and was widely worshiped in ancient Italy. The early Christians weren't huge fans, however, and identified woodpeckers with the devil. Thanks to the red-headed trouble-maker named Woody Woodpecker, the bird has been a part of American popular culture since 1940. In this guise, Woody embodies the trickster--the cunning and/or foolish rule-breaker. Though the story of a mysterious, disappearing traveler pops up in cultures around the world, the hitchhiking variant has become a classic American ghost story. The plot usually goes something like this: A couple of young men are driving along a deserted road when they see a young woman hitchhiking. They offer her a ride. She climbs into the back seat, says that her family lives a short distance away, and then falls silent. When the car reaches the house, the guys turn around to tell the girl she's home. But she has vanished. Confused, they knock on the front door and are told that the young woman they picked up disappeared/died in an accident years ago and has been seen hitchhiking on the same road ever since. Sometimes, the ride may be to or past a graveyard. 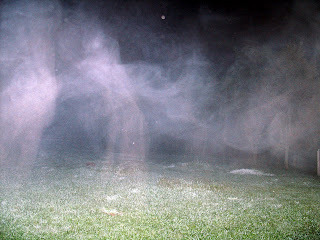 Occasionally, the ghostly passenger makes a prophecy or leaves behind personal property or other tangible evidence of his or her fleeting presence. In a version from the 1940s, an elderly woman who is given a ride foretells the death of Hitler before she disappears. For the Utah Mormons of the Church of Latter Day Saints, the ghostly traveler appears as a Nephite who aids stranded or injured travelers on lonely highways and also dispenses advice and/or foretells the future. One of the most famous examples in this category of hauntings also known as "road ghosts" is Chicago's Resurrection Mary, who has been scaring motorists on Archer Avenue near Resurrection Cemetery since her death on that road in the 1930s. We've all heard the stories...a friend of a friend who found a mouse in a Coke bottle or saw Elvis at the mall. The urban legend is widely seen as a form of modern folklore--cautionary tales set in our contemporary times. They're usually funny or macabre or flat-out gross. They can be specific to a particular culture or location, or they can have wider relevance. Back in the day, they were often passed from one person to another via the age-old tradition of oral storytelling. When I was in sixth grade, our class spent a few nights up in the mountains for Eco-Week. I still remember hearing the story of Stumpy, the kid whose legs were burned off below the knees who supposedly roamed the woods around the cabins. It's kind of funny when I think about it now, but at the time, I was terrified. In the age of the internet, urban legends can and do spread instantaneously. And perhaps that's the biggest cautionary tale of all. This is the German name for the magic hat ("camouflage cap" or "cap of concealment") that appears in both Norse and German mythology and legend. The cap made its owner either invisible or unrecognizable via transformation. In Wagner's Der Ring des Niebelungen, it is a helmet (tarnhelm) which is stolen from the dwarves by Loge/Loki. The tarnkappe is also the must-have accessory for an Alp, a supernatural being in German folklore. In its earliest appearances, the Alp is elf-like, responsible for mischief, trickery, and deception. Later, the Alp is more of an incubus, which visits during the night to cause terrible dreams. (The German word for nightmare is alptraum, which means "elf dream.") The Alp is also known for its shapeshifting abilities, which is where the tarnkappe comes in. Using the power of the cap, the Alp was able to take the form of a cat, pig, dog, snake, or small, white butterfly. Interestingly, the tarnkappe remained visible. So, if you see one of these creatures coming toward you and it's wearing a jaunty hat, you should probably turn around and go the other way. The tarnkappe was sometimes described as more of a mantle or cloak, and as such it pops up in Welsh folklore, Grimm's Fairy Tales, The Lord of the Rings, and, of course, the Harry Potter series. A hammer was an important symbol in world mythology because it could represent a weapon of protection or a tool for craftsmen such as smiths, coopers, and masons. It is uncertain what Sucellos used his for, but he doesn't seem to have a terribly war-like reputation. All in all, he was apparently a strong but benevolent dude who was also a master multi-tasker. In addition to thunder, he was the god of: the sky, the underworld, abundance, protection, dogs, trees and forests, ravens, agriculture, hammers, and alcoholics. The Roman goddess Robigo (or perhaps god Robigus; the gender is uncertain) was invoked to protect grain fields from diseases such as mildew and wheat rust. She was seen as a very ancient, and destructive, goddess. The festival in her honor, Robigalia, was held on April 25, when the crops were most susceptible to disease. Rituals included burning the entrails of a red dog and a sheep, and offerings of incense and wine. "Cruel Robigo, do not injure the young wheat; let its tender tip quiver on the surface of the ground. I beg you to allow the crop, nurtured under heaven’s propitious stars, to grow until it is ripe for harvest. Yours is no gentle power. The wheat which you have marked, the sorrowful farmer counts as already lost. Neither winds nor rain harm the wheat so much, nor does the nip of the white-glistening frost so fade it, as the sun scorches the wet stalks. Then this is the occasion for your anger, dread goddess. Forbear, I pray you, and take your rough hands from the harvest; and do not harm the farmer’s work. It is enough that you have the power to do harm." When I first learned that Robigo was the goddess of mildew, I chuckled. It seemed oddly specific, and I wondered if maybe she was a little miffed that she didn't get a better job. Goddess of love, maybe. Or wine. Or chocolate. But after I read Ovid's account, I thought, wow, she sounds like a badass, and the Romans were really afraid of her. It makes sense that they would want to safeguard their crops from her influence, because a few years of bad harvests can lead to famine and all kinds of societal ills. I'm not 100% sure the statue above is Robigo, but she looks pretty intimidating. Dread goddess, indeed! This fanciful creature comes from Arthurian legend. Called Glatisaunt, he had the head of a serpent, the body of a leopard, the rump of a lion, and the feet of a deer. The name "Questing Beast" refers to the deep, loud sound emanating from the beast's belly, said to be the noise of thirty hounds questing (baying as in pursuit). Various knights hunted Glatisaunt, with no great success. As should any self-respecting mythological animal, the Questing Beast continues to appear in popular culture, including T.S. White's The Once and Future King, Lost in Space (1967), the BBC series Merlin, and probably many fantasy novels. It is also the name of a blog and YouTube channel devoted to gaming. Specifically, I think, Dungeons and Dragons, but I don't know enough about that stuff to say for sure. That little sprig of greenery used as the ubiquitous plate garnish has a long history. In ancient Greece and Rome, it was associated with death and resurrection. To say someone was "in need of parsley" meant he or she didn't have long to live--and may also refer to parsley's deodorizing properties. The herb was dedicated to Persephone, goddess of the underworld, and tombs were often bedecked with parsley wreaths. Because of this reputation, the Greeks and Romans apparently weren't super thrilled about eating parsley but grew it for ornamental purposes and to feed to the chariot horses. In English folklore, things were a bit cheerier, as it was believed that babies were found in parsley beds. These days, parsley gets a lot more respect in the kitchen. It is an excellent source of vitamins A, K, C, and folate, and may lower cholesterol. The compounds myricetin and apigenin found in parsley have anticancer properties. Myricetin can also lower blood sugar and decrease insulin resistance. I don't mind the taste of parsley, but some people do. Fortunately, parsley doesn't have to be eaten plain. It can be added to soups, salads, smoothies, and can even be juiced. And a little goes a long way, in taste and for health benefits. Ouroboros, a Greek word that means "tail devourer," is symbolized by a snake or dragon eating its own tail. In the shape of a circle or figure-eight (i.e. infinity), it's one of the oldest symbols in world mythology, dating back to ancient Egypt. It usually represents the cyclical nature of life and the eternal cycle of destruction and re-creation. Perhaps it goes without saying that because snakes periodically undergo the process of renewal as they shed their skins, they're a natural fit for this gig. Notable ouroboros(es?) include the Norse serpent Jormangandr, who guarded the Tree of Life; the Aztec god Quetzalcoatl; and the serpent-like dragons of China. In alchemy, the ouroboros stands for the element mercury and the harmony of opposites. Due to its portrayal in black and white in that context, it is sometimes seen as an analog of the yin-yang symbol. 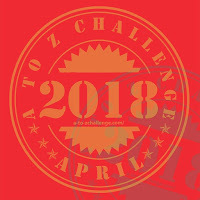 Welcome to the second half of the A to Z Challenge! To the Estonians, Nakk was an evil spirit who lived in the deepest part of the water. He could take many animal and human forms, though he was usually thought of as a gray old man who swallowed whatever came his way. Occasionally, he would sit on shore to bewitch people and animals with his songs, which forced them to dance until they fell in the water and drowned. 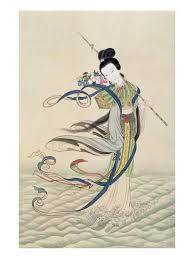 Nakk had a female counterpart, Nakineiu, a beautiful young woman who sat on a stone combing her long blonde hair. She also sang, and sometimes appeared with a half-human, half-fish body. Sounds a lot like a mermaid, right? Not too surprising, as mermaid-type creatures appear in folklore from all over the world. They may be known as sirens, naiads, rusalkas, maneli, jengu, iara, oceanids, and many other names. They pop up in hoaxes, such as P.T. Barnum's Fiji Mermaid and Animal Planet's "docu-fiction", and in art, literature, and popular culture, including the iconic Starbuck's logo. Mermaids may be good, evil, or a bit of both. (Hey, it's complicated being a half-human, half-fish.) And they are enjoying a bit of a moment these days, because why should Disney princesses have all the memes? To the Algonquin tribes of North America, manitou is the word used for the spirit that inhabits all things: animals, plants, wind, thunder, even rocks, the sun, and the moon. It exists everywhere and in some ways reminds me of the Force from Star Wars. The manitou often appears in dreams, where it conveys special protection. By entering a trance with the help of singing, dancing, drumming, and/or hallucinogens, a shaman could manipulate the manitou and heal patients. Some believed that the manitou lived in the stones of the sweat lodge and could, via steam, enter the body of anyone in the lodge and drive out illness and pain. In what seems a rather strange connection to me, German author Karl May (1842-1912) wrote many novels set in the American West. They feature an eagle named Manitou, who is protector of one of the main characters, the Apache leader Winnetou. Though May never visited the west, the books were crazy-popular in Germany and have sold more than 100 million copies. Apparently, May was smart enough, or lucky enough, to capitalize on a European fascination with the American West. When Buffalo Bill Cody visited Munich with his Wild West show in 1890, people camped out overnight for tickets. Eighteen shows in the 5,000 seat arena sold out, and even King Ludwig attended. Shortly after, May published his first of his more than eighty Winnetou novels. In Roman mythology, Lemures (also called Larvae) were restless, evil spirits of any dead not afforded proper funeral rites or burial. They often appeared in fearsome forms such as skeletons and caused madness in the living. Rites to expel them from the home were held during the 9th, 11th, and 13th days of May. This three-day period, called Lemuria, may have originally been known as Remuria, instituted by Romulus to appease the ghost of his murdered twin brother, Remus. As part of the ritual, black beans were tossed on the graves of the dead. Sometimes, the beans were burned, as the smell was enough to make the ghosts--and probably anyone else downwind--skedaddle. Carl Linnaeus, father of modern taxonomy and all-around smart guy who apparently knew his Roman history, named the group of nocturnal primates known as lemurs after the lemures. To the Lumba people of Zaire (Africa), Kalumba was the creator god who tried to keep Death from entering the world. His plan was to station a dog and a goat along the road and tell them to stop Death but allow Life to pass by. The two animals agreed, but before long, they got bored and started to argue. The goat left, and the dog fell asleep. Sure enough, Death came along, disguised as a pile of dirty laundry being carried by servants. The sleeping dog did not wake, and thus Death arrived in the world. The next day, the goat returned to his post--maybe feeling remorseful for being a jerk, but maybe not, because you know how goats are. When Life came strolling along the road, the goat mistook her for Death and attacked her. Kalumba was not pleased, though really he only had himself to blame, because as far as I'm concerned such an important job shouldn't have been delegated to a dog and a goat. By this point, Kalumba had no recourse, as Death was already at home in the world. So, Kalumba closed the road and probably tried to pretend like the whole thing never happened. Juniper is an evergreen shrub found in Europe, Southwest Asia, and North America. Many of us aged 21 and over may know that the berries are used to flavor gin. In fact, the name "gin" comes from the Dutch word for juniper, geniver. But juniper berries and oil have also been used as traditional medicines as far back as ancient Egypt for treatment of ailments as wide-ranging as cancer, indigestion, bronchitis, tuberculosis, heart failure, gout, back pain, gallstones, infections, and gonorrhea. Modern herbalists still use juniper in teas, aromatherapy, and ointments. The Navajo, who tend to be lactose intolerant, burn juniper wood and add the calcium-rich ash to blue corn mush. In legend and folklore, juniper is often used for purification after illness, for ritual cleansing at the new year, and to expel demons and other unwanted guests. It was apparently unlucky to dream of a juniper tree, but to dream of gathering the berries in winter signified coming prosperity. Juniper appears in the Bible, Native American legend, and Greek mythology. Not to be outdone, Grimm's Fairy Tales gives us "The Juniper Tree" story, which includes familiar Grimm (and grim) elements such as: red blood on white snow, a devout woman who bears a child and then dies, the wicked stepmother who takes her place, child abuse, deception, decapitation and dismemberment, cannibalism, a talking bird, helpful tradesmen from the village, red shoes for dancing, the stepmother's comeuppance, and bringing the dead back to life. Whew! We haven't had a trickster yet, and this one comes from Polynesian mythology. In addition to being a tricky fellow, Iwa was such a skilled thief that he stole while still in his mother's womb--no mean feat, that. In a contest with other thieves to see who could fill up a house with stolen goods in one night, Iwa waited until the other thieves fell asleep, made off with all their possessions, and filled up his house with them. Iwa also had a magic paddle which allowed him to row from one end of the Hawaiian Islands to the other in four strokes. I imagine that came in handy when the other thieves woke up in their empty houses and realized what had happened. Iwa means thief in Hawaiian, and the Great Frigate bird that shares the name is known for stealing food from other seabirds. I always assumed that the gremlins of legend had a long and storied past, similar to brownies, sprites, and leprechauns. But the gremlin origin story dates back only to the 1920s, when Royal Air Force pilots invented the concept to assign responsibility for otherwise inexplicable aircraft malfunctions. (The term gremlin is thought to be a portmanteau of Grimm's Fairy Tales and Fremlin Beer.) Some returning airmen even swore that they had seen tiny creatures sabotaging their equipment. Historian Marlin Bressi suggested that gremlins boosted morale by providing a means for deflecting blame. Move over, scapegoat, here comes the scapegremlin! Well before he wrote Charlie and the Chocolate Factory, author Roald Dahl is credited with introducing gremlins into popular culture. He had served in the RAF and survived a crash landing in the Middle East (Caused by gremlins, perhaps? The world may never know.). In his first children's novel, The Gremlins, the title characters were little men who lived in clouds and hangars and ate...postage stamps...? And who can forget the 1963 Twilight Zone episode, "Nightmare at 20,000 Feet", starring William Shatner and a gremlin who wears only slightly more eyeliner? Here's hoping you stay safe from the gremlins today, my friends! 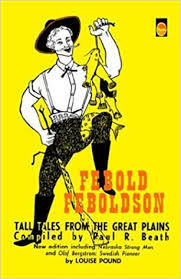 A Swedish-American plainsman from Nebraska, Febold is an American folk hero who could influence the weather as a cloudbuster/rainmaker. In one tale, he hypnotized frogs into croaking so loudly that a) the clouds thought it was thunder and began raining, or, depending on the version, b) the Native American rain god got a headache from all the noise and sent rain to shut the frogs up. Febold is often in the same class as Pecos Bill and Paul Bunyan, American heroes of lore who are perhaps not actually based on true folk tales but rather "invented" by writers. In the 1950s, this practice resulted in the coining of the term fakelore, meaning manufactured folklore presented as if genuinely traditional. But stories are fluid and change over time, and it can be difficult to draw absolute lines around them. So now, you're more likely to see the term folklorism in reference to the adaptation, or outright invention, of folklore. In the Andean highlands of Bolivia, Ekkekko is the domestic god of fortune, wealth, and plenty. He is portrayed as a small, jolly man with a pot belly who is covered with household utensils. According to legend, if you place a small object on an Ekkekko doll, you will receive what you wish for in the coming year. Miniatures are sold at market fairs in his honor, and Ekkekko amulets and charms are worn for good luck. I have to say, from his hat to his sandals, he exudes a pretty happy vibe!